Sting | News | Sting & Paul Simon: On Stage Together – Concert in Anaheim Confirmed! On February 16, 2014, Sting and Paul Simon will perform On Stage Together at the Honda Center in Anaheim, CA. Fan Club presales for Sting.com members will begin Tuesday, December 3 at 10AM (local time). American Express Cardmembers will have the opportunity to purchase tickets before the general public beginning Wednesday, December 4 at 10AM (local time). Tickets will go on sale to the public as of Monday, December 9 at 10AM (local time). 'The 12 Days of Christmas', the RFUK's fabulous and exclusive public auction of gifts donated by celebrities, luxury labels and esteemed Foundation friends, returns for a fourth fantastic year! 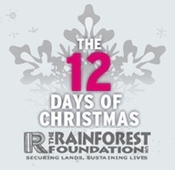 Open to everyone through an RFUK pop-up shop on eBay, the 12 day auction, running from November 20 to December 1, will offer various gleaming goodies for every savvy shopper ready to raise funds to protect the world's rainforests. The auction can be found at www.ebay.co.uk/12days.